Spring Wood is a small woodland area just outside Whalley in Lancashire. 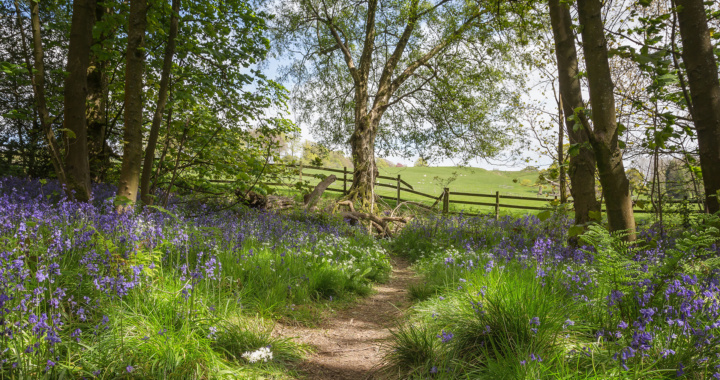 As the name suggests, it is best visited in spring, when there is a profusion of bluebells and wild garlic carpeting the ground – one of the best displays in the North West of England. There is a shorter low mobility trail, and a slightly longer circuit of the woods. Although there is some ascent to the highest point of the wood on the longer trail, the walking is very easy and the paths well maintained. All the photos here were taken in early May when the bluebells and wild garlic were in flower. From East or West, take the A59 between Preston and Skipton. Turn south onto the A671 just west of Clitheroe. The car park for Spring Wood is 0.8 miles south on the A671 at a set of traffic lights. If approaching from the south-west via the M65, leave the motorway at Junction 7 and take the A680 north before turning left onto the A671. Spring Wood is 0.6 miles beyond the junction. From the south-east, leave the M65 at Junction 8 and take the A6068 north, turning left onto the A671 at the first roundabout. Spring Wood is 3.5 miles further along the A671.